People are always fascinated by how animals eat and, I think, the weirder the better. Starfish have one of the most distinctive feeding modes of all animals and I think, that's why people get fixated on how they consume their prey. 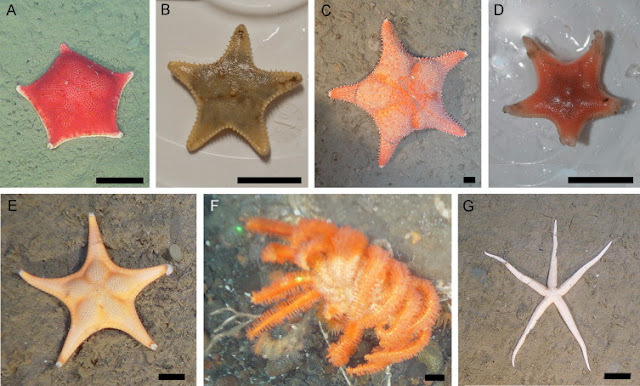 The feeding posts on the Echinoblog are among the top ten highest hit and the research literature is full of comprehensive studies detailing the feeding ecology and behavior of a great many starfish species. As one might expect, the great majority of feeding studies were initially those of shallow-water species which were easy to observe. Feeding is important to understanding marine ecology in many systems. So, its not just some casual trivia that comes in handy at cocktail parties. 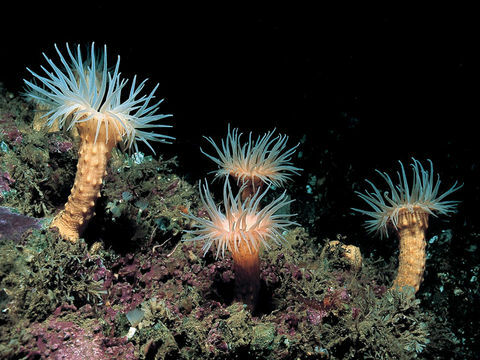 But what about deep-sea species? Understanding the role of predators in these often inaccessible systems is important. In cases, such as with deep-sea coral, its important to understand what role these animals play, especially given how little we know about the individual animal's importance. How does one figure out the role..and indeed, the importance of these species in such far away and forboding habitats?? 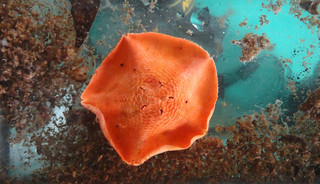 Today's Echinoblog post features work by Ms. Katie Gale at Memorial University who resides in the lab of Annie Mercier (and including Jean-Francois Hamel). Data from this paper was recently published in the new issue of Deep-Sea Research studying the trophic biology of various deep-sea asteroids from the coast of eastern Canada. (here). Directly: i.e., you watch a species consuming its prey (or whatever food) and voila! You have a direct feeding observation. In contrast, I think Ms. Gale et al's paper has acquired some great information using some modern techniques and good ol' fashioned detective work! 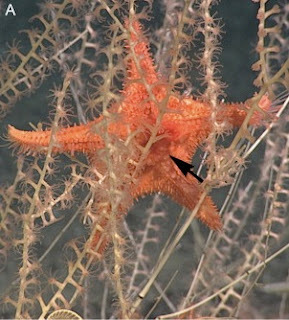 This is Hippasteria phrygiana, a widely occurring cold-water/deep-sea coral (and cnidarian) predator, but Gale et al. 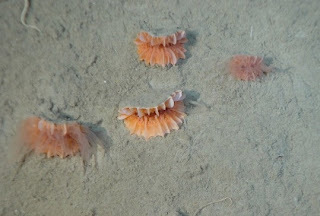 observed several other species from the deeps, about 500-1100 meter depths, of the North Atlantic. Several species were observed as predators for the first time, whereas others were confirmed. 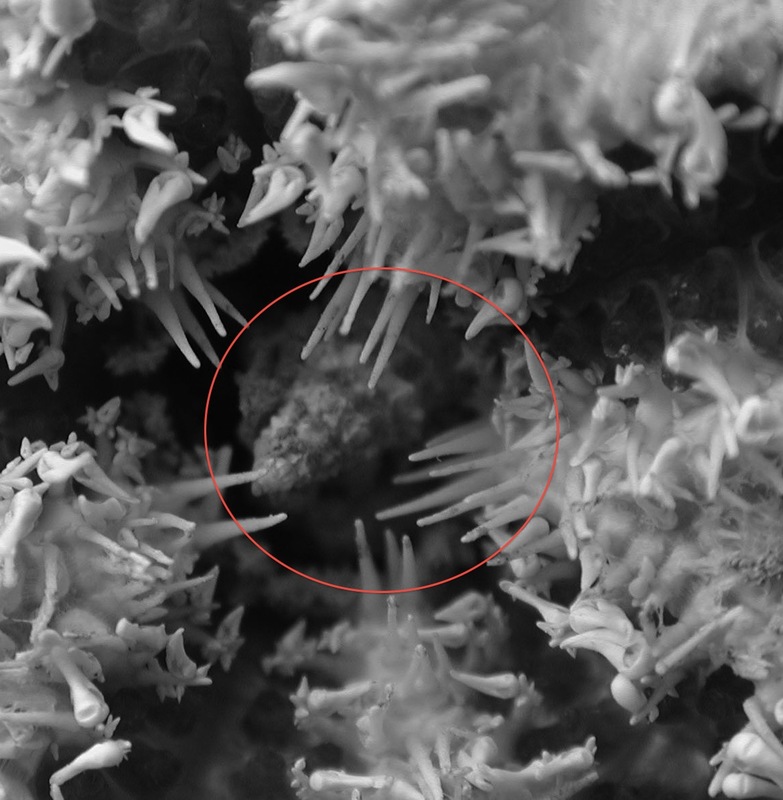 For example, Novodinia is a brisingid with a documented suspension-feeding mode and we saw more of that in Gale et al. 2013. As a complement to the direct observations, Gale also performed several laboratory feeding experiments and was able to observe several direct feeding moments! 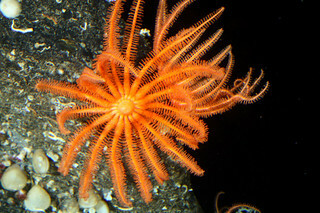 Predictably, Hippasteria fed on various cnidarians, including sea pens and other deep-sea cnidarians. Whereas Ceramaster fed on sponges..
used their tentacles (which all have stinging cells) as a defense against the oncoming hunger dogs! And this was effective against the more timid Ceramaster but not against Hippasteria. Flabellum was fed upon by Hippasteria VERY quickly (in 18 minutes).. Indirect Evidence. This is where some newer techniques shows us some cool ecological stuff!! Here is a video that explains the basics of stable isotopes but basically what it comes down to is this: elements like nitrogen (N) and carbon (C) undergo changes as they pass through different ecological levels in the environment. In doing so, they become kind of like a "fingerprint" for a particular kind of ecological role. So, for example, species with a stable isotope N (Nitrogen) value of about 16, but w/ Carbon value of about -14 (Hippasteria, Ceramaster and Mediaster) are higher within the overall trophic relationship among these asteroid species. 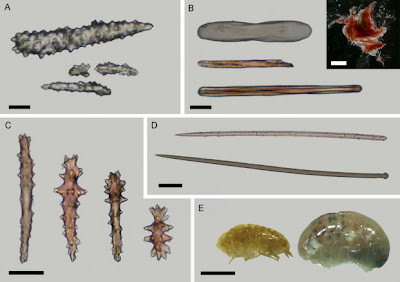 All the other species, including Novodinia americana, Leptychaster arcticus, Ctenodiscus crispatus and Zoroaster fulgens display lower values which would be consistent with their previously thought of feeding modes as suspension feeder (the brisingid) and deposit feeders/detritivores (mud stars, including Leptychaster and Ctenodiscus) and Zoroaster. Gut Contents & Prey Items! One other indirect way of looking at food items? Gut contents. What were they eating? 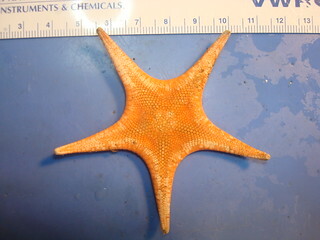 Ms. Gale did a LOT of work looking through the guts of many starfishes.. Much of how they fed is based on detective work. 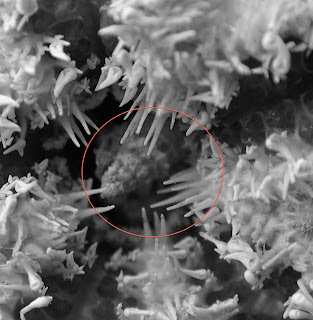 For example, many animals such as deep sea gorgonians and such, after being digested leave only skeletal bits called sclerites. Fortunately, these can be used to identify the animals with some accuracy. Curiously Hippasteira also had some crustaceans in its gut.. Figure 3 from Gale et al. 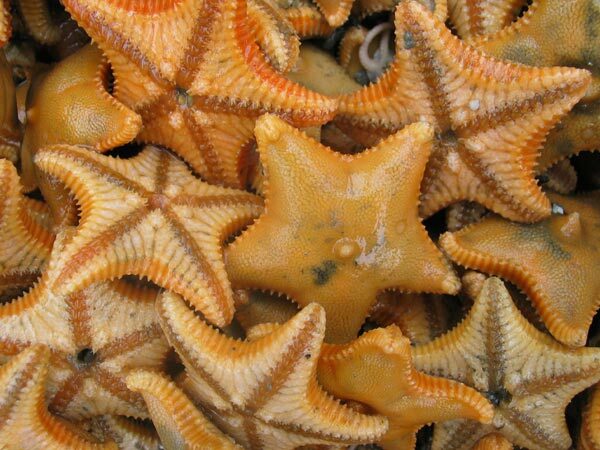 Ctenodiscus-the mud stars occur in LARGE numbers, up to ~6000 individuals per hectare and influence the sediment as they move around through it feeding on mud.. 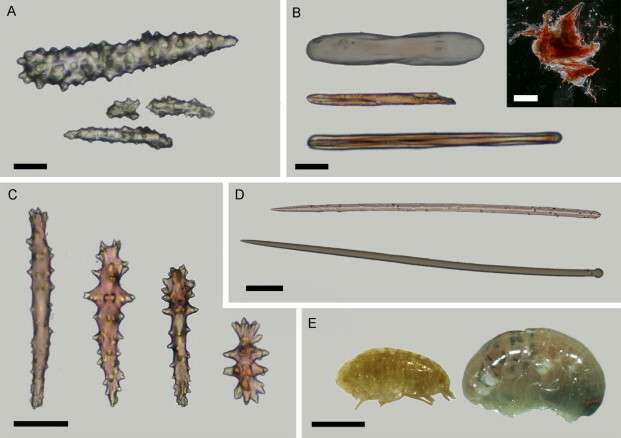 I've recently discussed some recent observations of a seemingly innocuous species, Porania pulvillus as a predator rather than a passive ciliary feeder. 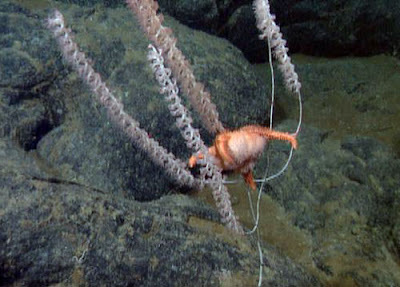 Understanding deep-sea ecosystems is an exciting endeavor, who knows what we'll find! Simple things like feeding are intriguing and interesting-but poorly known. What will the important impacts of these species be down the line?